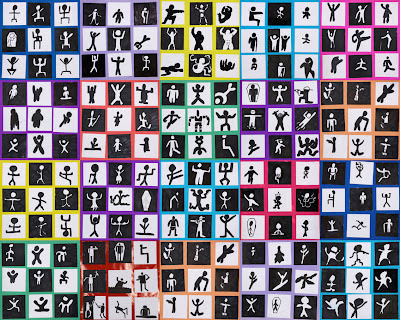 Each year 4 student created nine various pictogram-style people in black and white. They presented their collection as a 3 x 3 grid on a piece of coloured construction paper. I was with this particular class for a full week and they mostly worked on these during early finishing time. Initially I brought up some examples on the smart board and they sketched ideas in pencil before transferring them in permanent marker onto the small squares of art paper I had pre-cut. I asked the students that each of their nine people be obviously different in some way. It was a good way to occupy the students between other activities and I think they enjoyed the collective process. It's an effective way for them to manipulate positive and negative space too. This is the first time I've tried this lesson but I'm sure I will again in the future. 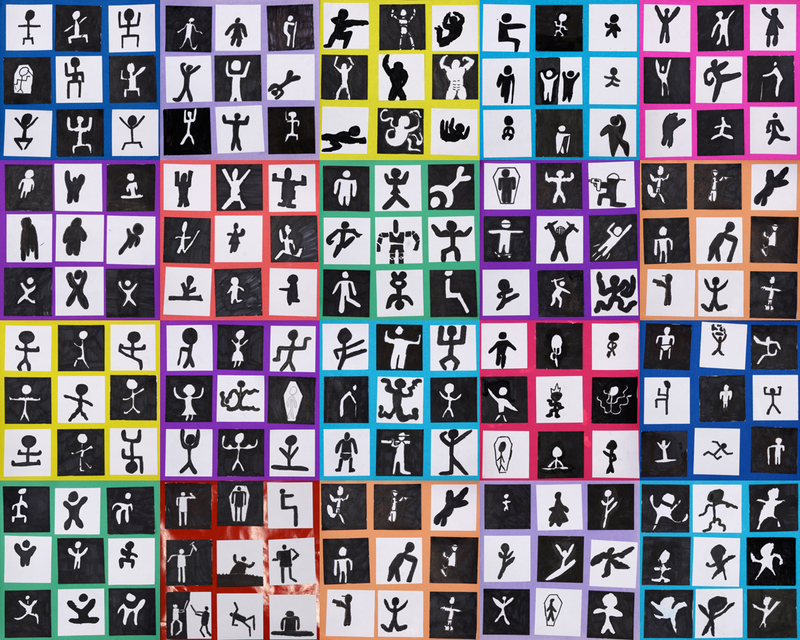 I think it could also be a good opportunity to look at and imitate Keith Haring-style people, but this is a future lesson! They look really cool all displayed together like that. I can picture it becoming a fabric design - can't you just see it on a giant floor pillow, or funky bedspread? Really nice! I'd buy the fabric! Thanks for this productive idea for early finishers! Can't wait to try it out! !